This post was previously published in 2015 but I just had to republish it again because of what is going on now in the media. Please I PLEAD with you, do read it to the end. According to Dictionary.com ''depression means a condition of general emotional dejection and withdrawal; sadness greater and more prolonged than that warranted by any objective reason''. Depression comes from different ways. It can come through rejections, abandonment, failures, disappointments, inner battles, self-esteem issues, constant criticisms, bottling things up, comparing your life with others etc. Depression is something people don't really like talking about or choose to ignore its presence or sometimes are not aware of its presence. 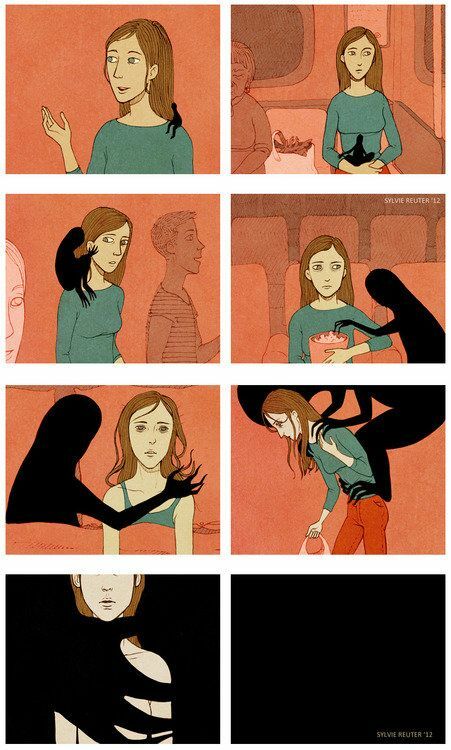 Depression is a slow but a very deadly poison. As shown in the picture above it comes without one noticing its presence and if care is not taken it gradually consumes a person's life. As a result of this, many believe that the last result or the best option is to either to take away their own lives or many begin to have psychological problems. To relief oneself from depression, the best solution most times is to talk to someone. Talking to someone doesn't just mean talking to anyone. Talk to someone who cares. Talk to someone who understands. Talk to someone who will encourage, inspire, motivate and strengthen you. Cry to God for help...Above all, seek for help. The truth is, the first step to seeking for help is to talk to someone. Just talk. Let it all out. You will realise that the more you talk, the more you fight this slow but deadly poison. The more you talk, the more you free yourself from it. Please don't keep things to yourself. Please don't let this slow but deadly poison overcome your existence or reason for living. Life is beautiful (please find a post on that here >>> chidinmainspirations.com/2014/09/life-is-beautiful.html?spref=tw …) please don't let or allow anything or anyone take away your joy, laughter, smile, happiness, peace of mind and/or reason to live. You are more than a conqueror. Choose to live. Choose to kick depression to hell where it is meant to be. Choose to fight cos in the end, you will look back, smile and say ''Thank God I didn't give up, now I know what means and how it feels to win''. You are a winner! You are a conqueror! Don't worry dear, God is already at work.